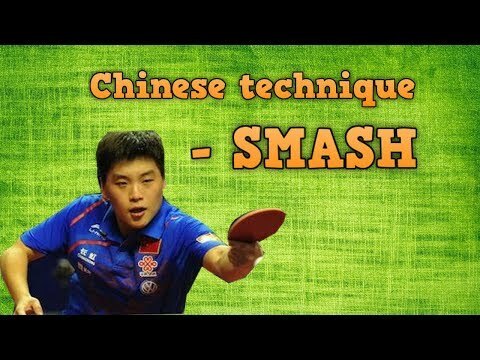 Today we will learn how to forehand smash in table tennis (Chinese technique). Forehand smash is an important technique in table tennis that you can use to finish the point. However, during training, there are not many high balls to practice. Amateur players often miss the ball during the real match. They don’t have a correct technique. How to do do the Forehand Smash in table tennis? Hao Shuai is a talented player. He is a few left-hand player in Chinese team. He is promoted to the team A, and is considered to be one of next top 4 in China Team. His career is very promising for a young 20 years old Hao Shuai (in 2003). But there was an incident in the Quater Final, 2005 World Table Tennis Championships. Hao Shuai played versus Maze, he was leading 3-0, at 10-8, he lost all the high ball. He can’t smash the ball effectively. Since then, he is demoted to the team B. His international career is ended. He is now considered as the “Blue Player” in China Team. Blue Player will imitate, copy the playing style of the major rival opponent. Hao Shuai must copy the playing style of Timo Boll, and served as a trainer to the top Chinese players. Timo Boll is also a left-hand player, spin oriented player (soft style). It’s similar to Hao Shuai’s style. So he is designed to learn and copy the style of Timo Boll. Blue players will be used before the Major Event Closed Training of China Team. After the incident, during a party, the head coach Lui Guoliang slapped on the face of Hao Shuai for his “stupid” mistakes. In a Western country, it’s impossible to touch another people. But in Asian countries, it’s not offensive. Smash is a basic table tennis technique. Chinese player rarely misses this point. Hao Shuai is a very rare case. That’s why he is kicked out of the National Team A. There are 3 steps to do the forehand smash technique correctly. Weight is transferred to the back foot (build energy). Transfer the weight to the front foot. Waist, hips, shoulders have finished rotating !! Strike the ball when the ball is at shoulder height !! There is 3 advice from the Chinese coaching to have a good smashing technique. Some players think that you need to hit very hard to smash the ball. No! Smash in table tennis is very technical. Don’t use full of your force (100%) you will miss the ball. Just use 80% of your force which would be enough. Kong Linghui is a merely an average powerful player, but his smash is very fast. Chinese philosophy focuses on the use of the whole body (legs, hips, waist, shoulders, and forearm) to add extra power to the shot. For the smash, you should fix the wrist, don’t use the wrist to increase the precision of the shot. Zhang Jike lifts up his right foot, to increase the center of gravity, and then use all of the body mass, to hit down to the ball. Don’t use wrist in your forehand smash stroke. Chinese technique: Use the full body mass on to the ball. Zhang Jike lift up his right foot. Another problem for an amateur player is the timing. They hit the ball too soon, or too late. If you hit too soon, the ball still has high velocity, and you will miss the ball. If you hit too late, your smash is not fast enough. (The problem of Hao Shuai). The best timing is when the ball just starts falling down from it’s highest position. At this position, the ball is high enough for you to smash it down, and it’s not too fast. You won’t miss the ball. Ma Long smashed the ball at it’s highest position (optimal timing). The second problem is some player just stand still at one position. You have time to move to the optimal position before smashing the ball. You need to move. Bring up your racket. Hit at the right timing. Hit the ball down. And move again for the next ball. Use the footwork pattern to move side by side in the smash technique. Hope you enjoy this ping pong lesson. Learn the forehand smash technique step by step, and improve your game. See you next Ping Sunday Table Tennis Tutorial, EmRatThich. Good points on how to execute the Forehand Smash. Keep it up Coach Em Rat Thich. Wow that is really informative coach. I never thought of that. I will try my best to incorporate your tactics in my personal training and matches. You’re knowledge and experience really is helpful to further develop my skills in table tennis. Thanks to you my coach from the other side of our planet. Awesome work… Outstanding explanation beyond technical, precise and easy to understand .. You’re the best coach I’ve ever seen…. Keep up the great work!! !